ADOM :: What do you want Jesus to do for you? Archbishop Thomas Wenski preached this homily during a Mass celebrated at Nativity Church, Hollywood, Oct. 28, 2018. The Mass was followed by an archdiocesan picnic to mark the 60th anniversary of the archdiocese. 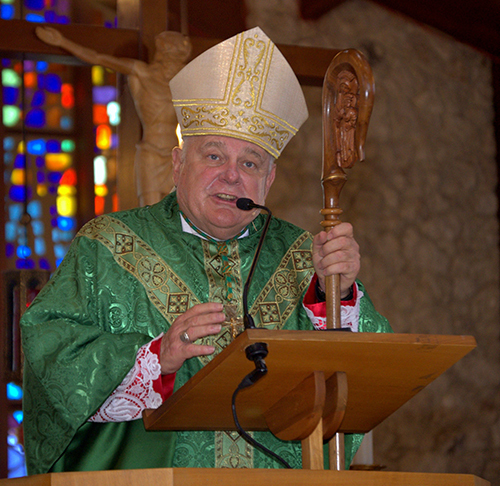 Archbishop Thomas Wenski preaches at the archdiocese’s 60th anniversary Mass at Nativity Church in Hollywood. Following the Mass was a special picnic, festival and concert on church grounds. James and John – and the other Apostles – followed Jesus to Jerusalem and to what would happen there. But, perhaps among all the disciples – at least until after the Resurrection – Bartimaeus was the only one who followed Jesus with his eyes really opened. And people, then as now, often do seek Christ for the wrong reasons. I recall how one time one of my parishioners asked me to pray over her; she wanted the Holy Spirit to cure her headache. I told her that if she wanted to get rid of the headache, better to take a Tylenol. Jesus doesn’t give you the Holy Spirit to take away headaches – but to make you his witness. And sometimes being his witness – especially in a world that seems to be increasing hostile to gospel values – will give you a headache. After the multiplication of the loaves and fishes, the crowds followed for free food. For James and John – at least in the beginning – it was for status and power. What are we looking for from Jesus? Do we pray like Bartimaeus for sight – to see with faith what God is calling us to? Or do we pray just to win the lottery? Lots of people do look for such tangible results for their having put their faith in Jesus. We see this often in the attitude of the adherents of the “prosperity gospel” preached by some of the T.V. evangelists. One of them, Benny Hinn, got his start right here in Florida – in Orlando. To build one’s faith in Jesus on the promise of prosperity is to build on sand. For faith in Jesus must be a faith in Jesus crucified. You cannot remove the cross from his message. In the 1970s, in many of our parish churches, the crucifix was removed from its position of prominence in their liturgical décor. An image of the crucified Jesus was often replaced by a “happier” Jesus; that is, with an image of the Risen Jesus. Of course, the desire to give emphasis to the Resurrection, which is the basis of our faith, is certainly legitimate. But one could ask if there was not also an attempt to accommodate to the self-indulgence of our culture by downplaying the “hard sayings” of the gospel. If we buy into this “health, wealth and prosperity” gospel, then inevitably we will undergo a crisis of faith when the cross intrudes into our lives. And the cross will intrude – whether through sickness, business failure or family crisis. Bartimaeus remains for us a model of true discipleship. First of all, because he is not put off by those who tell him to shut up. He kept the door open to faith, even when others wanted to close it for him. For those people who say they don’t go to Mass anymore because some usher or some priest was rude to them, I offer Bartimaeus for their patron saint. For those of you “too shy” to go to confession, Bartimaeus, someone not too proud to ask for mercy, could be your patron saint. For those tempted to expect God to shower you with favors, just because you follow him, Bartimaeus, someone happy to possess nothing more than the light of faith that saves, could be your patron saint. And so, for those of us who find it difficult to give up “the security blanket” of old habits of sin, we have in Bartimaeus a man who accepts the risks of discipleship with his eyes wide opened. God’s work was accomplished by Jesus – through the Way of his Passion, death and Resurrection. It is a work that calls forth from us – as it did from Bartimaeus – a great act of faith. This act of faith is expressed through our own giving of ourselves, our self-offering to the one sent from God, Jesus the Christ, not for the good he might do for us in this present life but, as St. Augustine said, for his own sake. This year, our Archdiocese – that is to say, this local Church – celebrates 60 years. In a Church that is almost 2,000 years old, 60 years might not seem like a long time, but here in South Florida, where everything seems like it was built just yesterday, 60 years is something to celebrate. As a local Church, as the Catholic Church in this part of the world, a Church that is criticized for the failures of its members, especially those of the clergy who betrayed their vows, we are challenged to rediscover the content of the faith that is professed, celebrated, lived and prayed so that as Catholics we profess that faith in its fullness, with renewed conviction, confidence and hope. “What do you want me to do for you?” Jesus asks. Do we ask for wealth, riches or power? The once blind Bartimaeus is a sure guide. The witness of our lives will certainly grow in credibility if, like Bartimaeus, we ask the Lord for the light of faith, the forgiveness of our sins, and the strength of his Holy Spirit so that we may always walk with him as his friend. 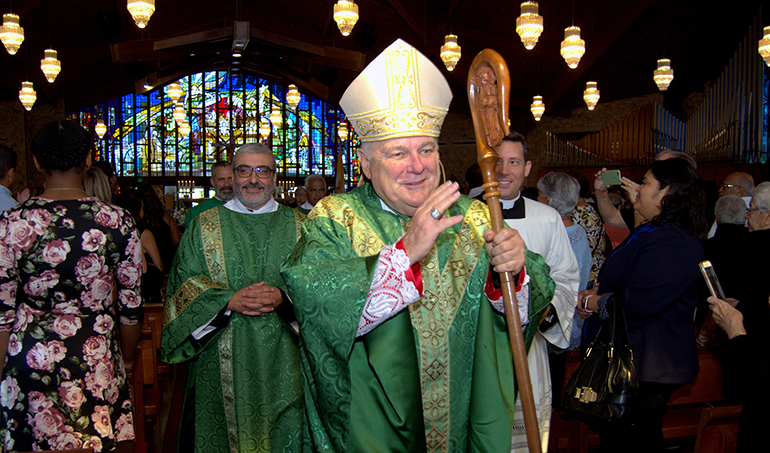 Archbishop Thomas Wenski exist Nativity Church at the end of Mass for the archdiocese’s 60th anniversary. Following the Mass was a special picnic, festival and concert on church grounds.